Crantzdorf Lodge is unlike any other Cabin/Lodge you have ever seen! 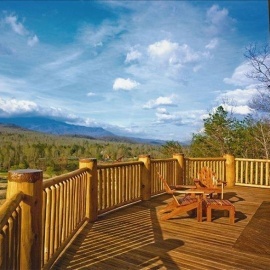 Its the most Luxurious Lodge in ALL of Gatlinburg yet it is also kid friendly.This absolutely spectacular lodge has no equal in the Smoky Mountains! 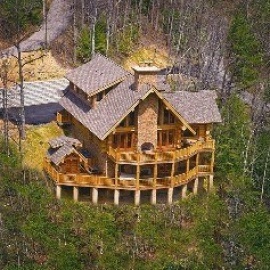 With its 'Big Log' Construction and the real bark trim in every room from top to bottom you'll feel as if you're truly surrounded by the forest even inside! Words cannot begin to describe the view from the deck of this cabin, looking out over a rolling golf course with ponds and all types of ducks, swans and geese. Looking past the golf course, you'll be able to take in the 150 mile view of the Greenbrier Pinnacle and let me tell you, it's simply breathtaking. Just imagine sitting in one of the relaxing Adirondack style chairs next to the huge open deck fireplace and taking in this spectacular scene with your family and friends.......pure bliss! Situated across from the Great Smokey Mountains National Forrest and just below the cabin is a beautiful public golf course, Bent Creek.